In a competitive index and nationwide ranking released by the National Competitiveness Council (NCC) last July 30, 2013 which provides potential investors informations on how cities and municipalities are faring in terms of cost and ease of doing business, two LGU's from South Cotabato were among the lists of 10 most competitive cities and 10 most competitive municipalities in the Philippines for 2012. 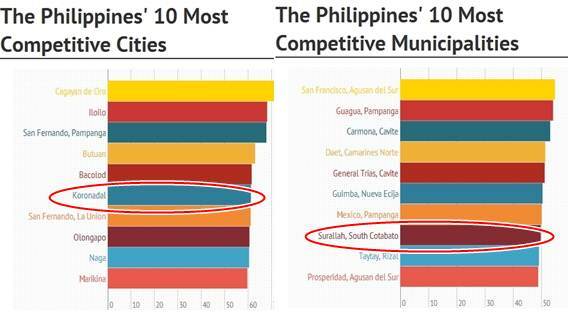 The City of Koronadal, which is the capital of the Province of South Cotabato and the regional seat for SOCCSKSARGEN or Region 12 is the 6th Most Competitive City in the Philippines. While the agro industrial town of Surallah is the 8th Most Competitive Municipality in the country for 2012. 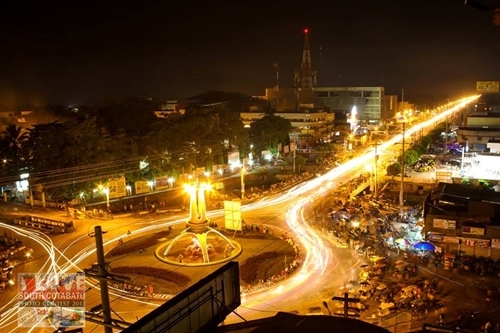 Koronadal also ranked 2nd to Quezon City in the economic dynamism index wherein a city was measured for business registration figures; employment, and financial institutions. The economic dynamism index is one of the three indicators used to measure the competitiveness of LGUs. The other two indicators are government efficiency and infrastructure. The competitiveness index covered 122 cities and 163 first class municipalities across the country. Way to go City of Koronadal and Municipality of Surallah!